Family Dog: Cavachons make great family pets. They enjoy accompanying their family on in whatever they are doing. Cavachons enjoy going to the dog park, going for rides in the car, going to the pet store and going along on other family outings. Shedding: Cavachons have a very low shedding coat which makes them a great choice for allergy sufferers. Grooming: The frequency a Cavachon requires grooming depends on the look you want for your Cavachon. The most common cut for the Cavachon is what is called the 'Puppy Cut'. This is where the coat on the body is cut short and the hair on the face and tail are left slightly longer. This cut will give the Cavachon a cute and clean appearance. 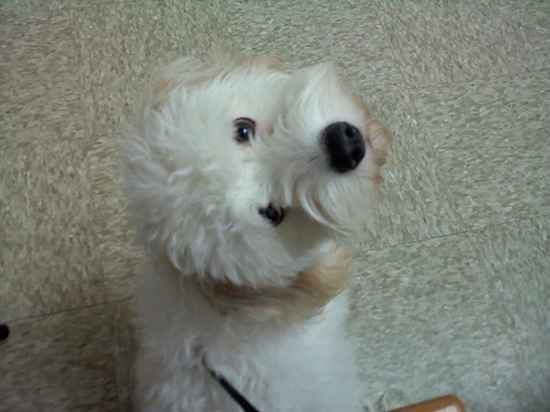 Training: Cavachons are relitavely easy to train with gentle and consistant training. Exercise: Cavachons have a low exercise requirement. A daily game of fetch inside should satisify a Cavachons exercise requirement. Size: Cavachons are usually 12 to 13 inches tall and weigh between 10 to 20 pounds when fully grown. Color: Cavachons can have a peach, peach & white, buff & white, sable & white, black & tan or tri-colored coat. Coat: Cavachons have a medium length coat that is smooth in texture. Life Expectancy: The average life expectancy of a Cavachon is 8 to 12 years. Characteristics: Cavachons are friendly, intelligent, gentle and playful dogs. Cavachons are very social dogs. They love to meet new people and especially children.